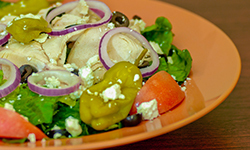 Hots Deli is a locally owned and operated restaurant located in Dothan, Alabama. 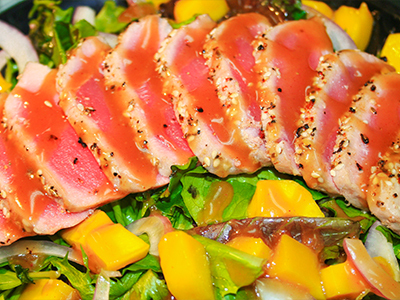 We pride ourselves in offering fresh, healthy options for every member of your family. 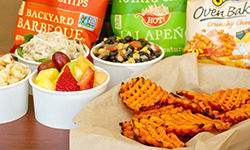 Purchased by Jason and Patricia DeVane in November of 2010, the company was re-branded to offer healthier options to break the "Circle of Chain Restaurants". 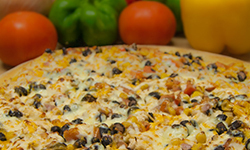 Our slogan of “Always Baked” refers to our pride in never frying anything! 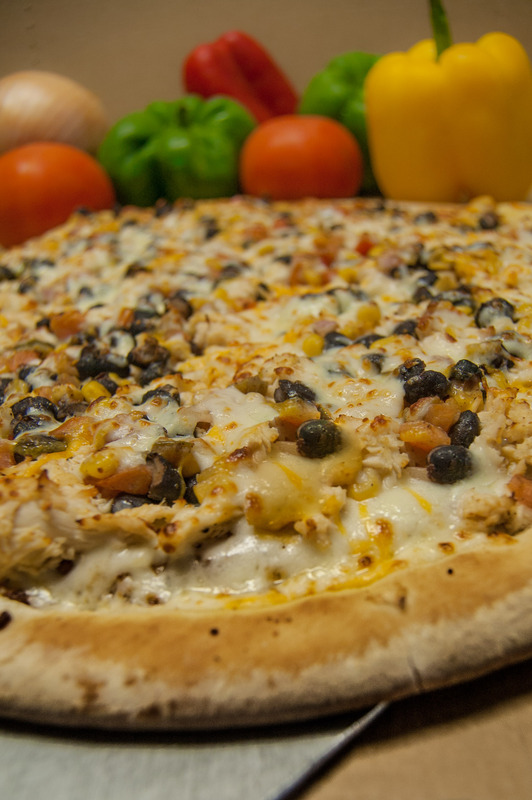 All of our items are baked to perfection to create a healthier option as an alternative to Fat Fried Foods! Ask about our other soups available daily.  Roasted Chicken Blackened and served on a Caesar or Garden Base served with Caesar or Blue Cheese Dressing. 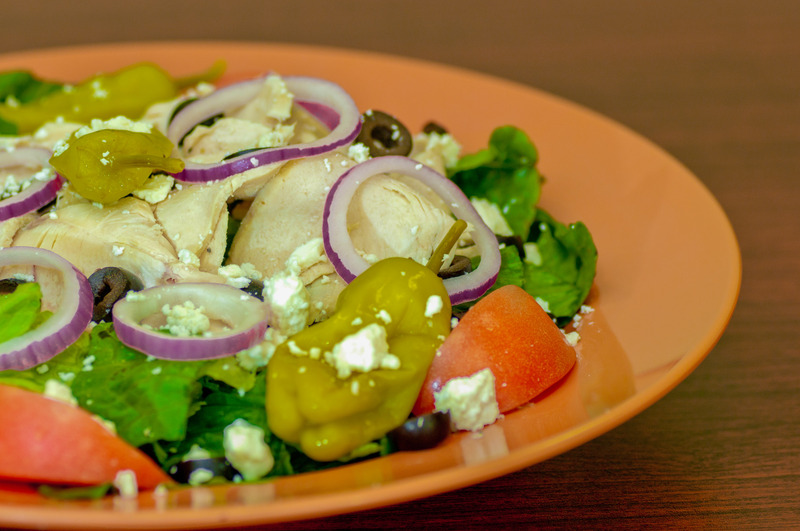 Your Choice of three: Chicken Salad (Regular or Buffalo), Greek Pasta, Mediterranean Cole Slaw, Fresh Fruit, Black Bean Salad or Potato Salad. All are Gluten Free unless noted otherwise. Make it a Combo for $2.79! 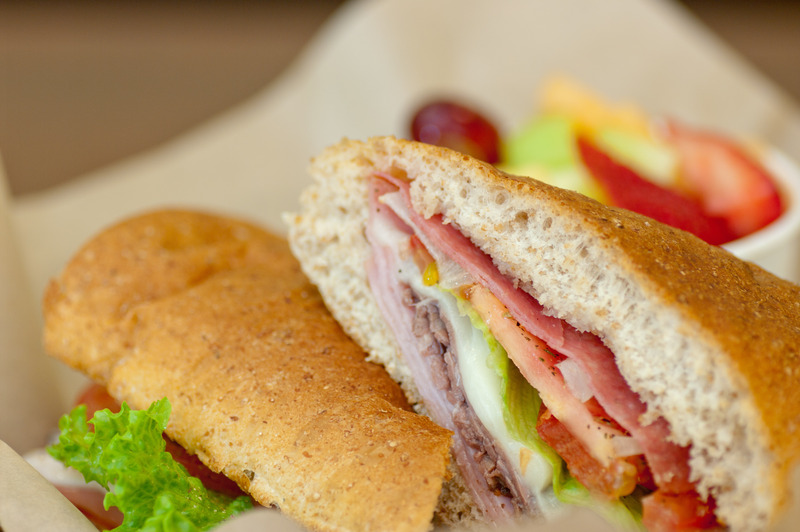 Add a side and fountain drink to any sandwich, wrap, pizza, wings, or quesadilla! 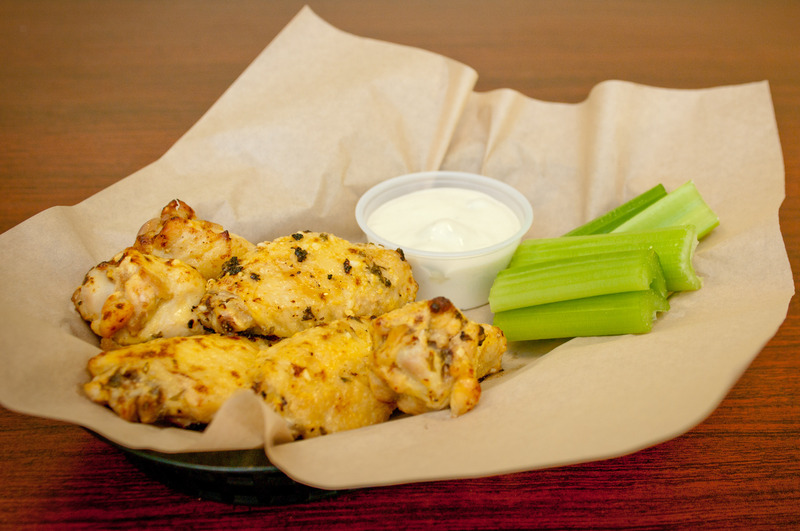 Comes with a side of Ranch or Blue Cheese Dressing and Celery if requested. All sauces are gluten free. Make it a Mini Meal $7.29! A half sandwich and a side of your choice with a fountain drink. Substitute a side for a bowl of soup for $2.00. 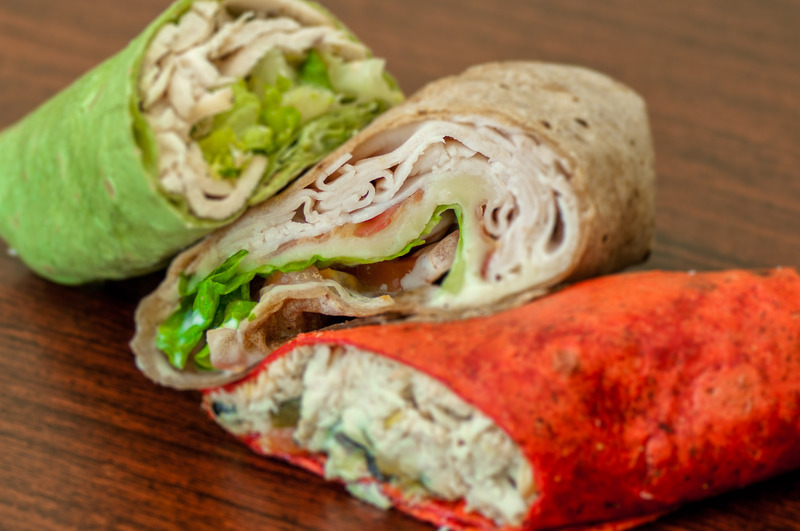 *all of these delicious choices come with Mayo and Mozzarella Cheese, but Tuna and Cheddar and Pizza Sandwich. 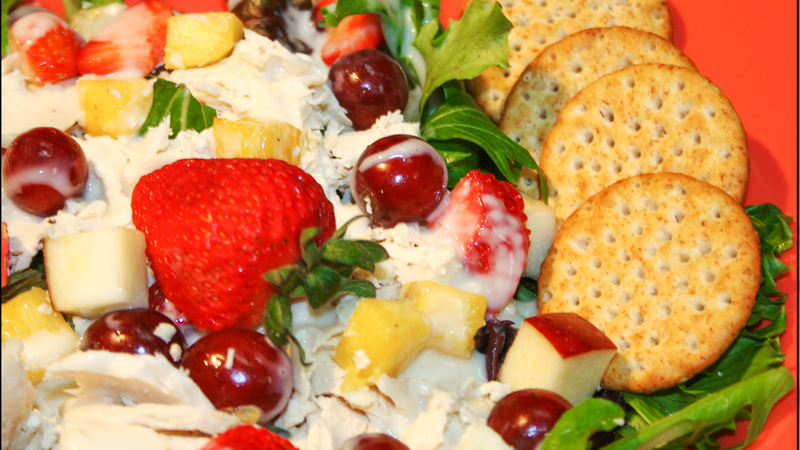 Our Homemade Chicken Salad, Mayo and Mozzarella Cheese. Try it Buffalo! 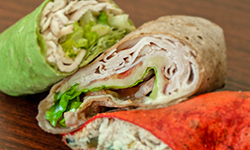 Our Oven Roasted Chicken, chopped Romaine and grated Asiago, lightly tossed with Caesar Dressing in a Spinach Wrap. Roasted Chicken with Mediterranean Slaw in a tortilla wrap. Comes with two Roll-ups. 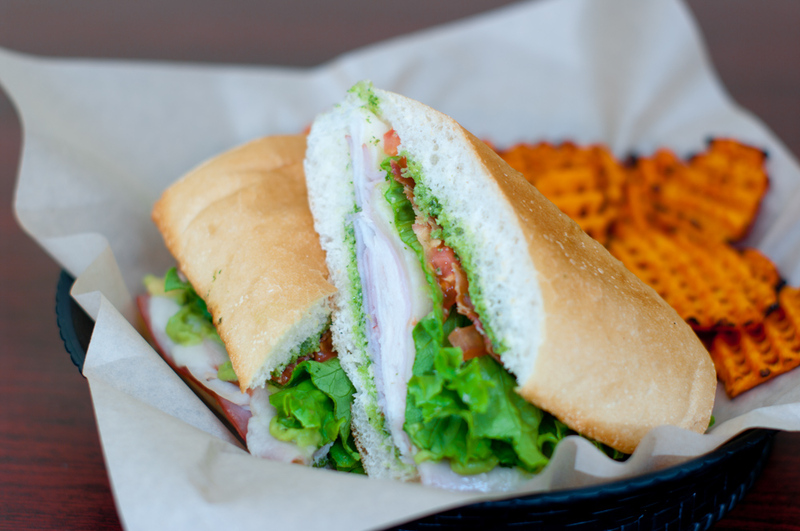 Choice of Roasted Chicken or Turkey with Bacon, Lettuce, Tomato, Mozzarella Cheese and Ranch Dressing. House Marinated Chicken, Black Bean Salad, sliced Avocados, Pepper Jack Cheese and Sweet Chili Sauce in a Wheat Wrap. Marinated Chicken, Mozzarella and Pepper Jack Cheeses with chopped Southwest Relish and a side of Jalapeño Ranch. 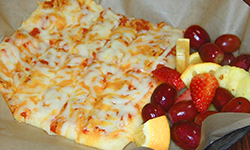 Flatbread crust with Pizza Sauce and Cheese (Cheesy Sticks have no Pizza Sauce). Kids Meals include a small fountain drink and choice of an entrée and a side. Available in Gluten-Free bread for $1.25 more. 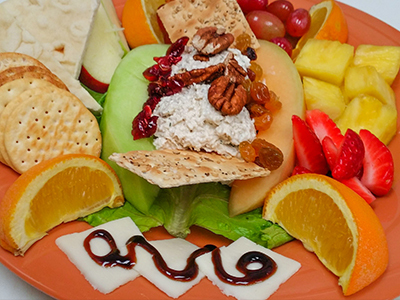 Our catering menu can be customized to fit any size event and any budget. Please call us if you would like to place an order. 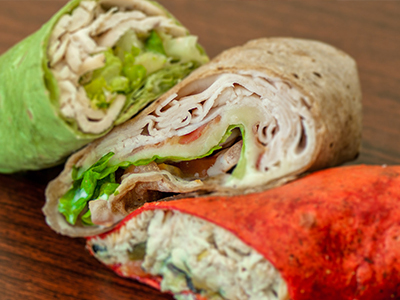 Choose from our delicious sandwich or wrap menu to customize a tray to fit your needs. Available in 16 piece, 24 piece, or 30 piece trays. 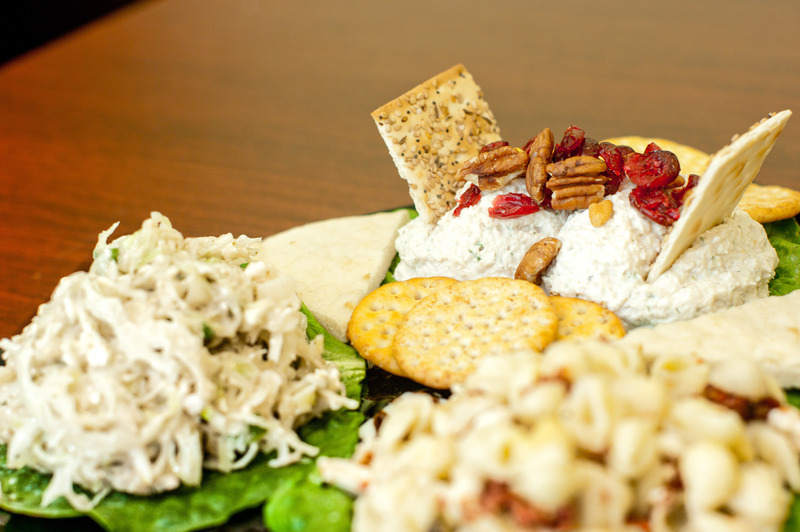 For an additional charge lettuce and tomato trays and condiments can be provided on the side. 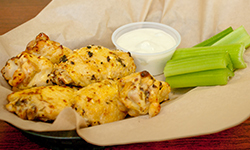 Create a tray of wings for a catering event or just for your game day party! Available from 20-100 or more. 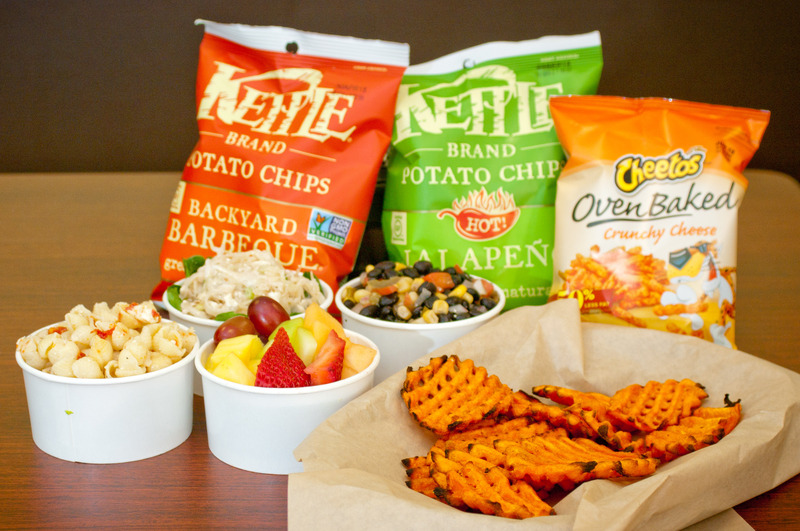 Choose from our delicious variety of flavors. 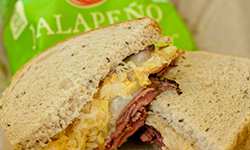 Interested in being part of the Hots Deli team? Click here and fill out the form. When you click ‘Submit’ your application will be emailed to us. Can you work split shifts? 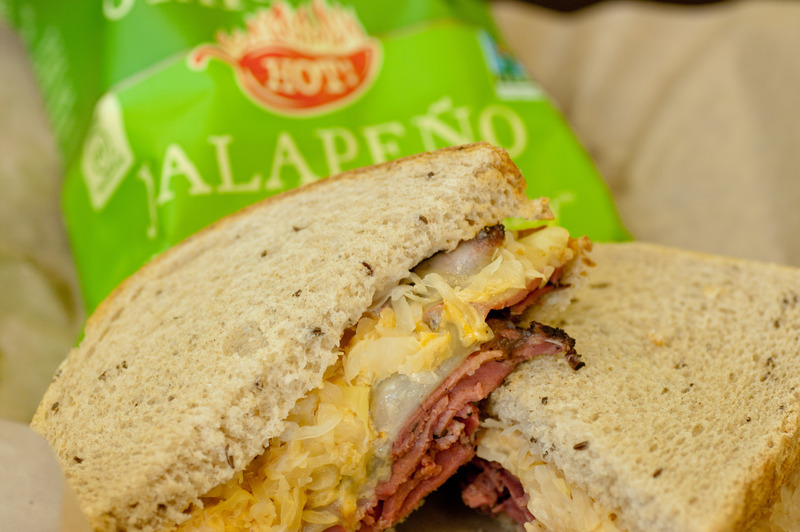 Check back soon for Hots Deli Merchandise! Hats, Visors and Shirts are on the way!